Praise God that October’s theme was “seek wisdom,” because November’s was “My Phone aka my map/contacts/translator/photos/communication/calendar/email/money manager/converter/life device Was Stolen” so “chaotic” would be a fair assessment of November. Not to mention my parents came to visit, I taught my first lecture, started my new job, helped out with another motorcycle race and talked my friend into going to the hospital. One of the few photos I have from my parents visit. 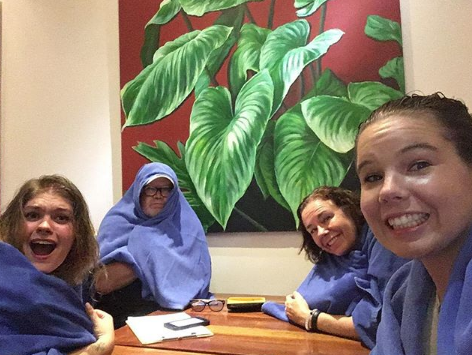 We got caught in the rain and their hotel brought us down towels to dry off. 1. I’m thankful Bullet and I were safe. It could have been way worse. I could have been physically harmed, he could have stolen my passport or my money, etc. Enough of the bad news. Amanda is heading back to the USA for Christmas so she’s bringing me back a new phone. Let’s keep talking about the awesome stuff that happened in Cambodia. Teaching Facebook metrics at NOMI Network. After my parents visit, I had the opportunity to teach a day lecture on Facebook metrics and marketing at NOMI Network to 16 small business leaders who are part of the NOMI Network. 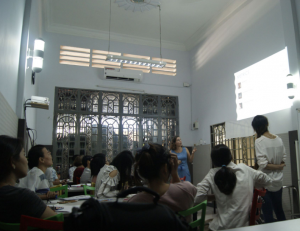 It was so great to share the knowledge I had about Facebook metrics to this community that is making a difference here in Cambodia. It also really opened my eyes to how complicated Facebook can be when English isn’t your first language. I got a lot of positive feedback from the class and hope to continue to keep teaching this course on a bi-annual basis with NOMI Network. My first month working at M’lup Russey was a lot of figuring out who does what, how to pronounce names, learning all the acronyms. My current favorite is “OVC” (orphans and vulnerable children). I keep thinking of Rachel Ray saying “EVOO” or “extra virgin olive oil.” They are basically the same thing right? I had some small wins at work, was able to help my counterpart translate his web pages into English, published some newsworthy updates on Facebook. Finally, I was able to edit some English subtitles on 13 videos that we hope to publish soon! Stef and I, on our bikes, in all our gear, on a ferry, headed to the race. 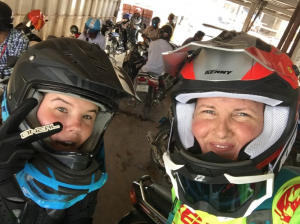 November also saw the final Enduro motocross race here in Cambodia. 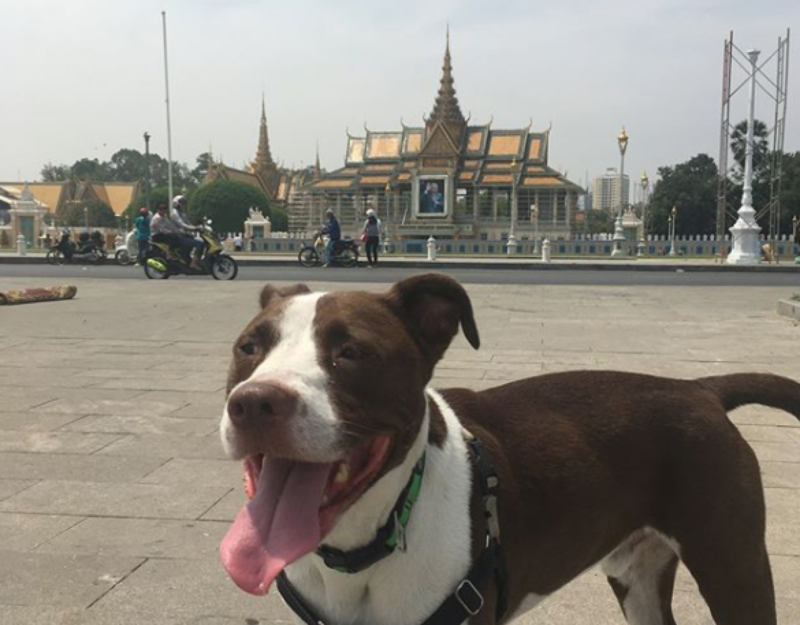 This time in Phnom Penh. You can watch the amazing Youtube video of the race here. I got to volunteer again with the timing team and had a blast as always. I’m so thankful the Welches invited me to the first race in May. I’ve made so many awesome friends from this group. Stef and I even got the chance to ride the course after the races were done. It took the best riders around 7 minutes to complete the loop. It took me about 32 minutes to complete a loop. Definitely somethings to work on in 2019. My Khmer friend’s foot 10 days after a moto accident. Last month, I finished this amazing book on medical cross cultural understanding. It’s called the, “The Spirit Catches You and You Fall Down.” I highly recommend it to anyone working in cross cultural situations. I try my best to learn from every situation, but I know there is always room for improvement. Medical situations I struggle with the most here in Cambodia. This is a photo that one of my dear friend here sent me. 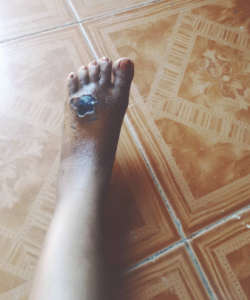 10 days after an accident, after her family paid for her to see a doctor to get an injection and advice “not to walk until it heals.” I lost it. I’m not even a doctor and I knew something was really wrong. I prayed then texted two of my friends who spoke better Khmer than me and asked for their help. A few hours later, a married couple from my Prayer Circle Cambodia team had talked my friend and her older sister into their car for a 1.5 hour drive to a hospital to get her foot looked at. She isn’t out of the woods yet, but she’s staying at home, keeping it clean and filling the hole in her foot from where the doctor “cut away the bad meat” in with honey. Please keep her in your prayers. 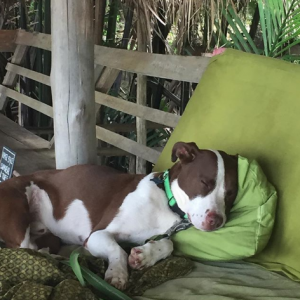 Bullet enjoying the spa in Kampot. Thanks again to my home church, Oaks Parish, for being my sending church and helping support me. If anyone is interested in making a end of the year donation, I’d gladly accept some additional funds. I’m hoping to meet some friends in Kampot (I do love it there) for Christmas and New Years. I’m looking forward to spending some time reflecting on this year, spending more time in prayer this Advent Season and gearing up for 2019. Christmas is right around the corner. I’d love to hear from all of you what you are doing this season. What you have planned and what you are looking forward too. How I can be praying for you. This will be my first Christmas without my family so please feel free to write to me. Or even better let’s find some time to chat via Facebook or WhatsApp or Goggle Hangout or Skype. I really love hearing from everyone back home. I look forward to hearing from you! As always prayer requests are below. 1. Continued energy with language learning. 2. I’m feeling really called to find Khmer woman as friends that aren’t tied to a place I work. Just some Khmer girlfriends where there isn’t a power play on my end. 4. Just for my heart during the Advent / Christmas season. I won’t be with my family and most of my friends heading home for this time. I’m feeling pretty good about it, but who knows how I’ll feel as Christmas day gets closer. It also means I’ll have more free time to chat / message / email.